If you are looking for a gaming mouse right now. You will be welcomed with a heap of options that you will have to choose from. This is certainly a good thing because it allows you to find all the right sort of products, and you can make the decision easily. There is just so much to choose from. However, the important thing that you must know here is that if this is your first time buying a gaming mouse, or any peripheral for that matters, you might find yourself stuck in a heap of options and no real direction as to what you are looking to go. With that said, if you are looking for the best wireless gaming mouse. We have curated this list for you in which we are going take 5 of the best gaming mice and reviewing them. As with some of our recent reviews, we are keeping the list short to make sure that there is no confusion present. We will be reviewing the bestselling mice that are known for giving you the best value for money as well. Therefore, you do not have to worry about finding a product that does not live up to the expectations. The first mouse are reviewing is from Logitech. For the longest time, they have released some amazing peripherals in the market. Whether you are looking for professional products, or you are looking for some epic gaming peripherals, Logitech has got you covered. Today, we look at the Logitech G903 Wireless. The mouse is using the famous PMW3366 sensor. The one sensor that still remains one of the best in the market, and can be found in the highest end mice in the market. Whether you are using the mouse in wired mode, or wireless mode, you will be getting stellar performance. As a matter of fact, there is absolutely no input lag when it comes to the wireless mode. Additionally, the mouse does come with the support for the Powerplay wireless charging. The mouse can be customized in any way you want, and last but not the least, the mouse comes with an ambidextrous design. On the split side, if you are going to look at some of the negatives about the mouse, you are not going to have an easier time. Simply because despite being very nitpicky, it was not easy for me either. 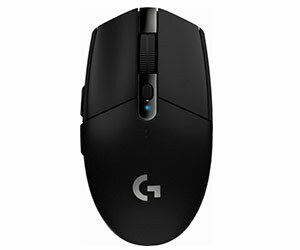 In conclusion, the Logitech G903 Wireless is one of the best wireless gaming mice you can buy tin the market. Stellar performance, ton of customization, and great looks are just few things making this mouse what it is. Reviewing this mouse was an absolute joy, and I did not find any issues. The performance is top notch. Logitech G Gaming is intuitive, and easy to use. The support for Powerplay charging is great. If you love Logitech’s products, but you are not in mood to spend a lot of money, then don’t worry. The good thing about them is that they are always releasing products that cater to everyone. So, even if you are not in the mood to splurge, there is something available for you as well. We are reviewing the Logitech G305. A simple, yet very effective wireless gaming mouse. The biggest benefit of this mouse? It does not cost a lot of money, the design is one of the best available in the market; it is comfortable to hold, and does not look shabby either. Additionally, the wireless performance happens to be one of the best you will get to use. Furthermore, the mouse is really easy to use, and does not require the user to go through the complicated processes that are common with some of the other gaming mice in the market. With all the good things, there are a few downsides to the overall great mouse. For starters, you do not get any Bluetooth connectivity, and additionally, the mouse requires AA batteries rather than having batteries of its own. These things do not necessarily hold down the mouse in anyway. At the end of the day, the Logitech G305 is still a great gaming mouse that is inexpensive, and gives you really great performance as well. The only downsides are that it lacks Bluetooth connectivity, and requires batteries to power up. Easy to setup and use. The mouse feels comfortable in hands. The mouse does not have support for Bluetooth connectivity. It uses AA batteries to power up. Corsair has always been one of those companies that tread the waters carefully before releasing something in the market. I have never noticed the rushing into a release, and that is certainly a great thing about them. This allows them to release some great products with ease and without any issues for the consumers. Today, we are looking at the Corsair Dark Core Wireless. Corsair took its sweet time releasing a fully wireless gaming mouse that is on the higher end of the spectrum, but I can tell you that the wait was worth it. The mouse uses the Qi standard to charge wirelessly, but you can charge it through the cable as well. Additionally, it is priced competitively, uses the top of the line sensor that is available in the market, and additionally, it has a nice, textured surface that allows for the maximum comfort, and grip. Another great thing about this mouse is that there are enough customization options to ensure that you are getting the best experience. There are a few things about the mouse that might not please everyone. For starters, the DPI button placement can be awkward for some people. If you overcome the slightly awkward placement of the DPI button, you will realise that the Corsair Dark Core Wireless mouse is one of the best you can buy in the market. The mouse gives top of the line performance, and most importantly, works like a charm. The overall handling and feel of the mouse is great. You can easily customize every single aspect of the mouse. The DPI placement is awkward. Logitech seems to be leading the pack with most of the options in the market. There is nothing wrong with it, simply because they are offering a lot of products for people who are looking to buy products of different price ranges. 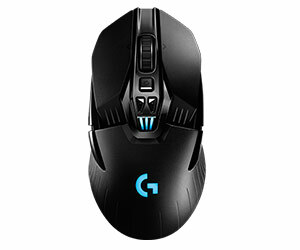 We are looking at the Logitech G603. This is a mouse that falls in the middle of the road. You are not going to get the high end features of Logitech’s gaming line up of mice. But the good thing is that you are still getting great performance, and overall value. To start, the G603 is one of the most comfortable mice I have used in the market. 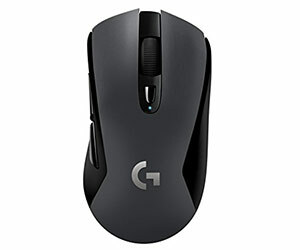 Additionally, Logitech has chosen a great price for the mouse as well as it is competitively priced. Moving on, the performance of this mouse is amazing; as a matter of fact, it outperforms based on the price you are paying. Overall, there are a lot of amazing things about the Logitech G603. However, with all the good things aside, there are a few downsides as well. For starters, the battery is not replaceable by the user, and you are not going to get a lot of features either. Overall, the Logitech G603 is a great mouse that offers excellent performance, design, and comfort. The mouse is not loaded with features as compared to some of the other Logitech mice, and the battery is not user replaceable. If you are okay with these issues, then you should definitely invest in this mouse. The wireless performance is excellent. The design is nice looking and comfortable to use. There are not enough features available. The battery is not user replaceable. The last mouse on the list is from Asus. Now for those who do not know, Asus has always aimed to push the boundaries when it comes to computer hardware. It is nice to see the company taking themselves seriously, and making good products that are making moves in the market. Today, we are looking at the ASUS ROG Spatha RGB Wireless/Wired. One of the most expensive, and premium wireless gaming mice you can buy off the shelf right now. It is made with premium materials and that is something that you will understand as soon as you take the mouse out of the box. It is one of the most beautiful looking mice you can buy at the moment, and if you are like me with large hands, you will have no issues handling the mouse either. There are countless features that you can use to make your overall experience even better about the mouse. The performance on both wired, and wireless mode is exceptional. 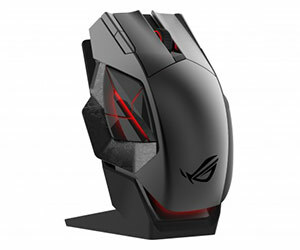 However, with all the good things aside, there are some glaring issues about the ASUS ROG Spatha RGB Wireless/Wired. For starters, the mouse is pretty large, and on the heavier side thanks to the material used in the construction. The charging plate that comes with the mouse is finicky at best, and the buttons on the side of the mouse are stiff. Keeping these things aside, the Asus ROG Spatha is perhaps one of the most premium gaming mice you can buy. Albeit, it suffers from some issues that might make you want to look elsewhere. The charging pad is finicky. The side buttons are stiff. Considering how the wireless technology in getting better, and better. Finding the right wireless gaming mouse can be confusing for some people. The older ones are just poor at best, while the newer ones are expensive, and some people still have trust issues regarding those mice. With that said, the thing here is that if you are looking for a good wireless gaming mouse, you can easily find one. This list curates the best ones available in the market, and you will be able to find the right wireless gaming mouse without any issue. If you are asking me for the best recommendation then the Logitech G903 is what I would recommend. Simply because the mouse comes with the best value for money, great features, ambidextrous design. 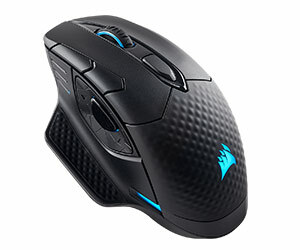 The closest runner up to the Logitech mouse would be the Corsair Dark Core Wireless. It performs on the same level as the G903, hence becomes the best alternative. I would not call it a runner up because they both perform more or less with the exception of the weight.